There are three basic types of Tower Silo each with its own unique characteristics. Be it Stave, Monolithic or Steel, they all have one thing in common, they are all Tower Silos. As you will see, they are not all the same; but that’s ok as not all farmers have the same needs or wants. You can choose between these three depending on what works best for your farm your circumstances. Wall thickness will range from 2&3/4” to 3-1/4”, depending on the block type. 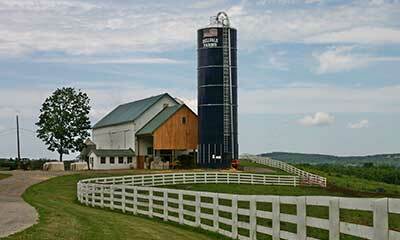 If a silo is needed quickly, can be ordered and built within a short period of time. Price tends to be more competitive than with Monolithic and Steel/Glass Lined silos. You can see how much steel has been used on the silo as the steel rods are on the outside. Stave silos can be extended if more storage is needed later on. Stave silos can be taken down and moved if necessary. Wall thickness will range from 5” to 7” (depending on the size and application) and is “Poured in Place”. 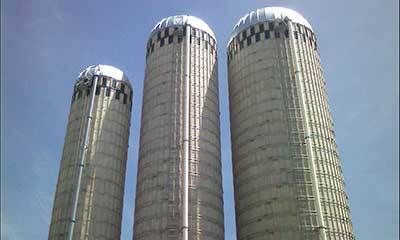 Monolithic Silos have no “seams” and tend to have a smoother wall surface. 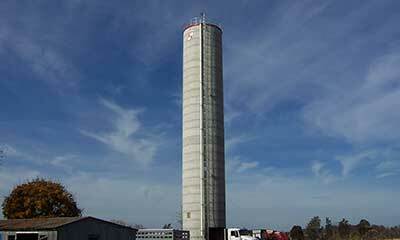 Sold as an extremely “strong” silo, it’s used frequently in industrial as well as larger agricultural applications. Built from “Glass Fused” steel panels, interior wall is very smooth and is sold as “oxygen controlled” by using air bags. (Note: Oxygen controlled does not mean “Sealed”). Glass Fused silos are designed to unload from the bottom. Thus: “First In – First Out” technology. Steel/Glass lined Silos tend to be more expensive when built to their original design, but will work better in certain applications. Steel/Glass lined Silos can be taken down and moved if necessary. Regardless of what type of tower silo you choose, you can be confident that a tower silo will work best for your application especially if you are currently automating, or plan to be automating your feed system in the future. Nothing works quite like a Tower Silo! Note: Concrete Stave and Monolithic Silos are built to strict construction standards developed by the International Silo Association. For more information, please contact us.